Effective with Instant Games introduced in 2014, Internet Winners in Second Chance Drawings will not be required to produce their tickets. Carefully enter your ticket information. Internet Entries containing ticket information that is not consistent with Lottery records will be disqualified. All entries recorded in Eastern Time. Actual entry and drawing dates are subject to change at the sole discretion of the Mass Lottery. Odds of winning any prize in a Second Chance Drawing will vary depending on the number of entries received for that drawing. 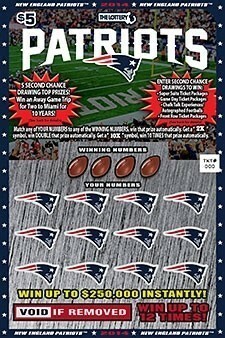 Complete lists of winners will be posted after certification of drawing results by Mass Lottery. The certification process can delay posting of winners for a week or more after the drawings. © 2014 Massachusetts State Lottery Commission, All Rights Reserved. A Commission under the Office of the Treasurer and Receiver General of the Commonwealth. Do you have a problem with gambling? Call the compulsive gambling hotline 1-800-426-1234.